Melodics is a free drum learning software to improve your drumming skills including timing, rhythm, and muscle memory. This software offers various drum lessons which you can practice by playing a virtual drum. The lessons are from different genres such as Hip Hop, Dubstep, Classic Break, EDM, House, etc. Actually, when you start a lesson it gives you various tasks like playing Kick Pattern, Snare Fill, etc. while matching them with visual beats. When you complete a lesson, you will get scores which will help you level up your drumming skills. This software is quite similar to one of the best guitar learning software “Frets on Fire” where you match the visual notes by pressing different keys. It supports electronic MIDI drum kit which you can connect to your PC for practicing the lessons. But, if you don’t have one, then do not worry as it can automatically map keys on your keyboard to different parts of a drum kit. 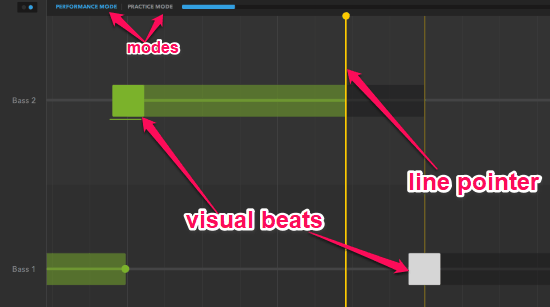 The visual beats can be practiced in two different modes named, Performance Mode and Practice Mode. If you’re a beginner then starting with the Practice Mode is the best option before you move to the Performance Mode. Note: The free version of Melodics offers 20-25 free lessons for you to practice. But, you can remove this limitation by purchasing different subscription plans. To get started, simply download and install Melodics on your PC. You will get the download link at the end of this post. After that, simply open it up and sign up for a new account. Once you’re in, simply click on the “Hamburger” icon on the top-left and then choose “Lessons” from the menu. After you do that, you will be able to see all the free drumming lessons which you can practice. To open a lesson, simply click on the “Play” button associated with the lesson. When you do that, you will see all the tasks which you need to complete in this lesson on the left panel. 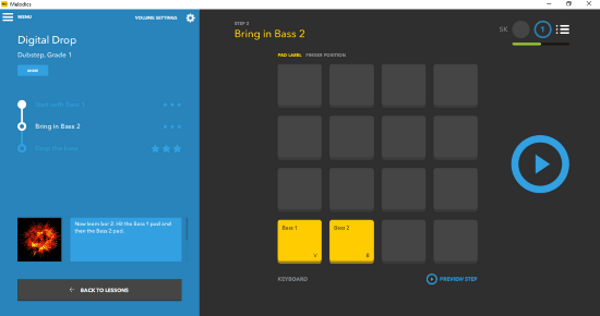 On the right panel, you will see the mapped keys which you can use to play drum beats. For example, it generally assigns the Kick to the “V” key and Snare to the “B” key. Now, click on the “Play” button the right to proceed to the visual beats window. Once you click on the “Play” button, the visual beats window will appear where you will see both the Performance and Practice mode at the top. Initially, the “Performance” mode is selected and you can start practicing just by pressing the Spacebar. As soon as you do that, the visual beats will start running from right-to-left while playing the tune of the lesson genre. Now, you have to press on them using the mapped keys. To do this, all you gotta do is press the appropriate key when the line pointer is on top of a beat. This is how you can complete all the tasks in a lesson and improve your timing, rhythm, and muscle memory. Once completed a task, you will be awarded scores based on your performance. 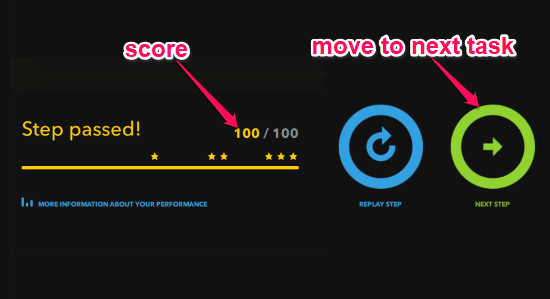 If your scores are good, then it will allow you to move to the next task and ultimately complete the entire lesson. Similarly, you can open other lessons as well and complete their associated tasks. Select output device and latency manually. Configure Metronome, Backing, and Audio Latency while practicing. See and complete auto generated goals for each day. Practice free courses like HipHop Basics, Rock Beats Paper, etc. Melodics is a pretty interesting drum learning software which helps you practice playing drums with visual beats. There are many software available which allows you to play drums on your PC. But, Melodics is quite unique as it focuses on helping you improve your drumming skills instead of simply letting you play drums.